NZDUSD pair looks to build on its Friday correction in the new week as it saw price weakness during early Monday trading session today. Support lies at the 0.7300 level. Further down, the 0.7250 level comes in as the next downside target. 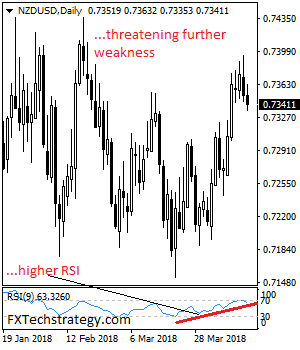 Conversely, resistance resides at the 0.7400 level where a break will aim at the 0.7450 level.